The Choirs of All Saints Northampton & the Northampton Bach Choir. Be Merry! is the first joint recording between the Boys, Girls and Men of All Saints and the Northampton Bach Choir. A number of tracks have been recorded by the combined choir – 150 voices in all – and others are recorded by one or more of the separate choirs. 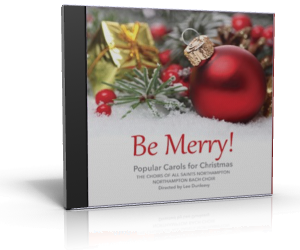 The disc features Christmas choral classics in new arrangements by American composers for choir and piano accompaniment – in some cases piano duet accompaniment. Many of the carols receive their first commercial recording on this disc.